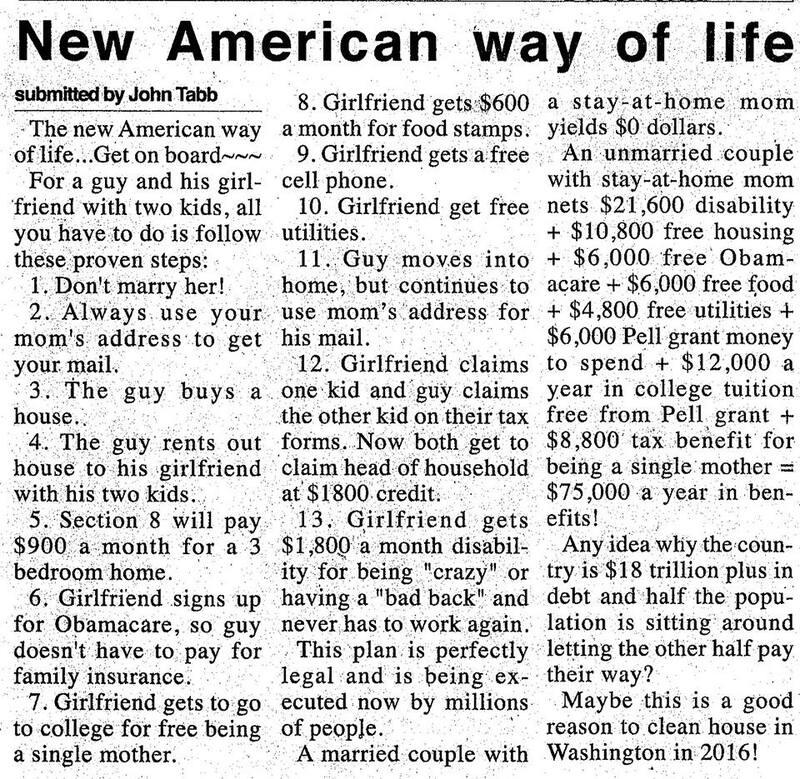 I've recently seen this "article" titled "New American way of life" all over my Facebook feed. It's credited to John Tabb and has been printed in the Miller County Liberal of to Colquitt, Georgia, on August 19, 2015. Supposedly, the article exists in an earlier form credited to John Rightmire. Whoever wrote it, it's a delicious piece of conservative-whacking welfare trolling that offers a very far fetched approach to gaming the system. There are so many blatant falsehoods in this New American Way Of Life that I had to counter the points. First off, the waiting list for Section 8 housing, even to get a voucher to play the system like points 1-5 is suggesting, is incredibly long. You'd have to wait years for that to kick in. 6: The Affordable Care Act does provide subsidies for lower income families, but only provides "Free" healthcare to incredibly low incomes. Even then, those on the plan still have to pay out for co-pays, hospital visits, etc etc. The girlfriend in question could possibly get the kids on a state Medicaid program, but, once that's done, the state will look to the father to see if he is getting insurance through his employer and would then force him to cover the kids through his plan, thus screwing up the plan for the father is this hypothetical scenario. 7. If there were a way for a single parent to go to college for free, I'd have had my PhD by now. There simply aren't any state or federal programs that do that. The best one could do is qualify for a Pell Grant, but such grants are not dependent on one's parental status. And, if we're to assume that the girlfriend in question is a stay-at-home mom, then how is she going to have the time to go to class? 8. A family of three (girlfriend + 2 kids) would qualify for a MAXIMUM of $486 in SNAP benefits. This assumes zero income, as Mr Tabb states that the girlfriend in this hypothetical scenario is a stay at home mom. In most cases, if a single mother applies for SNAP benefits, the state will go after the father for child support payments to the mother in order to reduce/eliminate her monthly benefit. So, the father in this hypothetical piece would be screwed. 9. So-called "Obama Phones" existed before Obama was ever in office. It's called The Lifeline Program and it only offers discounts, not free phones. Some cellular providers do provide free cell phone programs, but they do so on their own dime. 11. That's actually illegal and would be considered fraud. 12. It doesn't work that way. If each parent is claiming one of the two children as a dependent, than the mother can’t be legally collecting benefits (such as SNAP) for both children. 13. Disability claims have to be well documented by medical professionals and securing benefits is not an easy task. Often, one has to go to court in order to claim disability. And if the girlfriend in question wasn't working to begin with (via the earlier points) she wouldn't get much out of the system because she hadn't earned enough work credits to begin with. I know a lady who has been trying to get disability for years. If she's not actually disabled, she's putting on a great act and has me and her family and friends fooled. She has been shut down in hearings at least twice and has resulted in absolute zero disability payout. It's not nearly as easy as walking into an office and saying "I'm crazy!" or "My back hurts and I can't work!". The author of this New American Way of Life sums up his OP ED piece by placing the blame for the budget deficit on the shoulders of the social welfare system. One can debate the costs and benefits of social programs, but, instead of talking about people taking advantage of the system, perhaps we should be more concerned about the system taking advantage of the people. Wall Street gets trillions of dollars in tax incentives from the government while maximizing shareholder and minimizing employee compensation. The social benefits that are handed out are just scraps compared to this. Married couples receive MORE benefits that unmarried ones.The address thing is blatant fraud & the agencies WILL find out.They demand, and will dig to find out, who the father of your children are, and that is always factored into the assistance given. Either his income is factored into your assistance, whether or not you live together, or he is REQUIRED to pay child support. As you said, Section 8 doesn't work like that. The loopholes to even qualify, let alone get on the years long waiting list, are tremendous and most of the time unfeasible for someone. Same as you stated for the "free" health care. There is absolutely NO free college for single mothers. The average food stamp assistance for someone with absolutely no income is around $100 per person, but you also have to not be receiving any sort of other assistance to receive more of the average or high end of assistance. There is no such thing as free utilities unless you are living off the grid. In most places there is zero assistance for water bills. LIHEAP provides assistance with gas and electric. In emergency shut-off notice cases (i.e. it's freezing outside and you're heat gets shut off) they will, if you qualify, get it turned back on for you. This is a one time a year assistance. Other than that, they will put you on a budget plan which is 10% of your income per utility or $10 per utility, whichever is GREATER. Point #11 is blatant fraud, and again they WILL find out. As you stated with the taxes, it doesn't work that way with the assistance, plus if you are receiving SSI, you cannot file taxes in the first place. What you said about normal disability benefits is right. As far as "permanent" SSI goes where you are disabled from childhood with a life-long disability, unable to ever work, the maximum benefits (regardless of marital status or children) is $721 per month. = $9,130 a year in actual benefits. ...But don't forget, the father's paying taxes helps to pay for his family's assistance in the first place. This is the reality of it. Thank you for helping to debunk this horribly false article. So many people's heads are filled with these twisted ideas and they spew such hatred towards those that need help. They look down on use like we are less than. They tell people like me that I should have aborted my son so that I wouldn't create another mouth for THEM to feed. It's a disgusting stigma, and false articles like that only further perpetuate it. I hope that they do not one day have to get caught into this system that is actually designed to keep you from getting ahead. I apologize or such a long comment. I'm just very glad that you addressed this issue. Thank you. You get all federal taxes back and then some under EIC unearned income tax credit. There are takers and makers and you and yours are takers. Ask Steven Hawkings how to become a maker. Don't throw stones while you're living in a glass house, Mr. Anonymous. I work for a profit school and I have current students and countless graduates that are working the system. To make my case I will interview one student and have her give me the breakdown of what she receives in welfare benefits and will post it here. I will even go further and consult with my cousin who is one the director's of Section 8 and my other cousin who is a social worker to confirm. Will post shortly the total. I don't doubt that some people do game the system. However, I don't believe that it happens to the extent that "John Tabb" says, because, as I pointed out, much of what this "New American Way Of Life" is impossible to pull off. But, by all means, if you can prove otherwise, I'd love to see it. Tommy Mac and Vanessa Baker are defending theft. I'm defending theft by pointing out the incorrect assumptions in an unsourced op ed piece? Quite a leap you're making there, Batroc. Yes, I'm defending theft. The theft of human intelligence with false propaganda that has zero sources because it contains zero truth. It only takes a person of average intelligence less than a hour of fact-checking to disprove every point made in that article. If Guy is using home as a Section 8 rental, he is losing out on significant tax benefits that owner occupied tax payers receive and if he sells or loses home to foreclosure, he will suffer even greater tax losses as a rental property owner due to capital gains or deficiency cancellation. Also, Head of Household is a deduction, not a credit which means if Girlfriend has no income, she reaps no credit. If she is on disability, any "food stamps" she qualifies for (his child support will be included in her income and benefits phase out once her net income hits a maximum of poverty level) will be decreased by $200 monthly. Finally, Obamacare does not provide free healthcare. If an individual has an income that makes it impossible for them to pay premiums by government calculations, they qualify for Medicaid. I just wanted to say with Obamacare, I was unable to afford it so I got penalized on my income tax earlier this year. I'm not exactly sure how people get it if they don't work, but my cousin's wife doesn't work and she has or, at least, was...getting free medical. I'm not sure if she still is without being penalized. Also, in the state where I live - Louisiana - they don't have Medicaid Expansion, so I was unable to qualify for Medicaid. Normally you have to be disabled for one year to get it on your own (I tried some years back). Come to California. Most of those things mentioned by John Tabb are true. Would you care to elaborate on how California embodies the John Tabb New American Way Of Life. Mr. Anonymous? How do you figure that I'm defending the system by pointing out incorrect assumptions made by John Tabb and his New American Way Of Life article? I find it ironic that you boast about your wife and daughters working at Wal-Mart considering Wal-Mart has several employees on its staff who are also on public aid of some sort, to the tune of $6.8 Billion. This is pretty typical of large corporations. If only they'd pay their workers a living wage, then we wouldn't have this huge welfare system, we wouldn't have so many abuses and we wouldn't have so-called "conservatives" like yourself flagellating themselves over a fake article about welfare abuse. It cracks me up how crazy people get when their way of life is threatened. Don't you know these poor leeches have to live w the guilt of getting money illegitimately? They should be compensated for that as well. Anyway - want the bare bones truth? The article is an exaggeration. The article is the truth. The leeches have 800 other little scams they run to perpetuate their fraudulent existence that are not mentioned in this article. (See how I exaggerated "800" - but its still true. Crazy huh?) The system is fucked. The article is merely a lot of nonsense. What is really sad is that the intellectually gullible believe such garbage, go out and vote on the basis of it, and shoot themselves in the foot by not having help that's needed when they fall on hard times themselves. The Koch Brothers of the world thrive on such stupidity just to shive a few more dollars into their own bank accounts. Get your heads out of your asses people. This happens. My girlfriend from high school was on welfare for food stamps and medical for the kids from 1991 - 2014. She is not on SSDI though. I was blessed to have section 8 housing and worked a full-time job. I was not on medicaid or food stamps but my son had medical through the state. My son's father on the other hand was on Section 8, married with a wife and two other kids and on SSDI himself. He gave me $50 per month for child support and when he passed in 2008 was over $1300 in arrears. He smoked, drank and abused prescription drugs which evenually caused his overdose death. $6.00 per day for cigarettes x 30 days = $180 per month of taxpayer money being sucked down his lungs. Add another pack per day for his wife and that is $360 per month. There are perfectly healthy people who KNOW how to exploit and use the system. There are plenty of people sucking up my (our) tax dollars to make their way in this world with their hairdos, mani/pedis and gambling habits. I don't think anyone is denying that there are people who cheat the system. I'm just saying that the scenario outlined by John Tabb in "New American Way Of Life" runs counter to reality and is damn near impossible to fully pull off (for reasons I outlined in my original post). I'll go further and say that the number of people who are systematically cheating the system in that sort of regard is a tiny minority. It's easy for you to focus your vitriol on those abusing the safety nets because it's a problem that's close to you. It's one that you can see with your friend from high school and your ex-husband. But, where's your hate for corporations who are abusing the system to a much higher financial degree? You either don't see it, or you're too used to casting your hate downwards. The original author presented an unlikely scenario .... but there is some truth behind it. IF you are receiving Soc. Security Disability or have been "homeless" (usually shown by having stayed in a shelter for some period of time) 3 times during the past 3 years, your Section 8 application is expedited and takes as little as 2 months to process. A Section 8 recipient pays 1/3 of their income for housing (so a recipient of an $800 dollar benefit pays $266 out of pocket for their housing which usually is approved if it is less than $700 (i.e. a benefit of $434). HEAP benefits frequently pay arrears on utility bills, but only 1, sometimes 2 times per year. .... and after disability is proven a recipient can work up to 20 hours per week (which gives the income required to file for the EIC benefit as head of household). Claiming a child as a dependent who has not resided with you for more than 1/2 of the tax year is illegal - but does occur, sometimes abetted by the other parent. Neither Section 8 nor Public Assistance permits a "live-in", but again, it happens all too frequently. There is a pervasive belief that "if you can get away with it you are entitled to receive benefits. This, unfortunately bankrupts the programs and makes administrators crack down - usually by making it more difficult for people to receive benefits in the first instance (i.e. some disabled people have difficulty "qualifying" for the benefit which is deserved and can make the difference between being poor and chronically unable to pay for necessities like decent housing, food and utilities. The whole mess is made worse by an economy that is driven by low-paying jobs with few or no benefits, high unemployment (multiply the official gov't rates by at least 2 to include those who have, for all intents and purposes, given up on finding work and now try to get any benefit they are able to get in order to survive) and the fact that some people are forced to continue on public assistance or lose valuable health benefits (blood pressure med's, diabetes meds, psych meds, etc.) if they are "lucky" enough to find a job that pays $12.00/ hr. (a monthly income of $2500 becomes 2000 after taxes, $1700 after paying for "Obamacare" (I hope we can come up with a better name after next year) and that may not cover prescription co-pays after paying rent, food, utilities and probably supporting a vehicle to get to that job - support for children or aging parents eats further into any money "left over". The original piece, while voiced as an indictment, is really the writer showing people that they can arrange their lives for a lower liability just as the rich do.